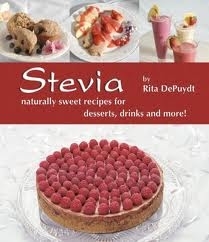 Stevia Naturally Sweet Recipes for desserts, drinks and more is a combination of recipes and insights about using Stevia from both of Rita DePuydt's older books listed below. Her books are geared toward healthier cooking and not just the replacement of refined sugar. Stevia is a blessing for those with diabetes but it does take some good advice and experimenting to use it well. Stevia Naturally Sweet Recipes for desserts, drinks and more! Be sure to visit our Stevia page to purchase Stevia plants or for more information on this versatile and important herb!